Blogging is a form of online publishing that has been growing in popularity for the last decade. While the roots of blogging lean more toward personal use, blogging has become increasingly popular for business use, too. As an entrepreneur, you may question how necessary blogging is to your growth and success. With the day-to-day demands of your core business, plus servicing all client, administrative, and marketing needs, it can be difficult to imagine also making time from something like blogging. So, Why Should Blogging be a Business Priority? 1. Continual publishing to the internet – Websites are static; they don’t regularly have new information to pull clients in. But business websites with a blog component are repeatedly publishing new, fresh content to the web. This continual web publishing means opportunities for increased website traffic and better search engine search results. Plus, Google favors “fresh” content, so new blog posts help to keep your site current and relevant in Google’s eyes. 2. Demonstrating your expertise – As a small business owner, you can use your blog to write about topics that are relevant to your field and clientele.Â Acting as a knowledgeable resource for your clients will increase your credibility with them and be seen as a value-add to doing business with you. 3. Social media marketing tool – If you are building a Twitter presence or have a Facebook fan page, new blog posts mean new content to promote. It’s difficult to build an active social media presence without something new to catch the eye of your customers and bring them back to your site. 4. Showcase new products or services – A new blog post can be the social media equivalent of a new product press release.Â If you are a small business owner, publishing a new post may be a way to advertise a limited-time special or a new service you are offering.Â And if you are an etsy shop owner, use a new blog post to publicize the new product you’ve added to your store. 5. Blogging helps with SEO â€“ Search engine optimization sits at the core of online business. Optimizing your site means that it is more likely to come up higher in search engine searches, which – in turn – means that you can increase your traffic and sales. 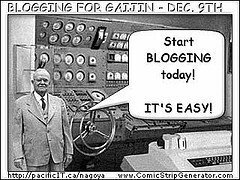 Publishing blog posts as part of your website builds links for your site. And the more high-quality links you have? The more the important your site becomes to the almighty and powerful search engines. 6. Blogging is an easy, free way to have a web presence – Small business or handmade shop owners who don’t have the resources to hire a web designer to set up a site for them, can use a free blogging platform like Blogger.Â This easy-to-use platform option is a perfect way to create a web presence for your business without an initial investment. A blog is a simple, effective way to establish yourself as an expert in your field while driving traffic to your site on a regular basis.